In an unusual move, Russia's ambassador to the United Nations, Vitaly Churkin, sent a letter to the editor of The New York Times last week congratulating the paper for an article questioning Tbilisi's claims that it had acted defensively. "It took [U.S. media] three months to start telling the truth about the August war in the Caucasus," Churkin wrote in the letter's full version, published on the Russian Mission's web site. The article in question, published Nov. 7, reported that military monitors for the Organization for Security and Cooperation in Europe said the Georgian military had attacked Tskhinvali, the capital of breakaway South Ossetia, exposing civilians, Russian peacekeepers and unarmed monitors to harm. The paper said the monitors' accounts were inconclusive with regard to establishing blame, but that they call into question Tbilisi's assertion that it the Aug. 7 attack on Tskhinvali was in self-defense. "Indeed, as the article notes, the war was started by the Georgians under a false pretext on the night of Aug. 7," Churkin wrote. The article appears to be part of a broader trend in the West of re-examining assumptions about the outbreak of the war — a trend greeted positively in Moscow. Prime Minister Vladimir Putin's spokesman, Dmitry Peskov, said Western media coverage, long accused by Moscow of suffering from a heavy anti-Russian bias, was slowly changing. "We are seeing more and more objective accounts now ... and attempts to find the truth," Peskov said Friday. "We can only welcome that." He also hinted that the Russian government was at least partially responsible for the change. "We said from the beginning that, sooner or later, the truth would find its way out," Peskov said by telephone from the Moldovan capital of Chisinau, where Putin was attending a summit of CIS prime ministers. While a Western news bias may have played a role, the Georgian government also likely benefited from a better PR strategy to get its side of the story out in the aftermath of the conflict. Foreign reporters working in Tbilisi after the five-day war found officials and press spokespeople to be easily accessible and ready to help them travel through the country. 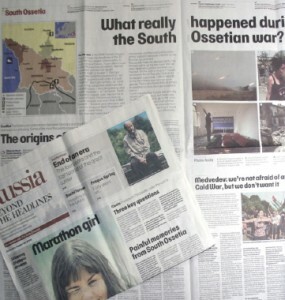 The Russian military, by contrast, placed severe restrictions on travel where it was operating in Georgia proper, and reporters ran up against numerous obstacles while trying to travel to and work in North or South Ossetia. And, although the Kremlin hired high-powered PR agencies Ketchum and GPlus Europe in 2006, officials in Moscow have not broken the habit of rarely speaking to international media. The Georgian government says the media coverage merely reflected the facts and not media strategy. "While some commentators have classified our efforts as a massive PR front, we simply allowed the journalists to discover the truth for themselves by providing accurate information," Giga Bokeria, Georgia's deputy foreign minister, said Friday in e-mailed comments. "Then the journalists investigated these developments and simply reported on what they found." Patrick Worms, of Aspect Consulting, a Brussels PR firm working for the Georgian government, manned its press center in Tbilisi's Marriott Hotel almost constantly in August. He said the media perception differed over time, but that merely reflected the course of events. "In the very beginning, the Georgians were the bad guys. Then the Russians lied so much that they became the bad guys," Worms said by telephone from Brussels. "Now people are making their own investigation, like The New York Times did." He also said the reporting differed from country to country and that the Times article did not get much attention in Germany and France, for example. "What counts in the end is what the international commission will find," Worms said. The European Union announced in October that it would set up a commission to investigate the outbreak and course of the war. Worms also used the term "dubious" to describe the chief source for The New York Times article, Ryan Grist. Grist, a former British Army captain who was deputy head of OSCE's mission in Tbilisi when the war started, left the organization shortly after under unclear circumstances. Attempts to reach Grist by telephone and e-mail on Friday and over the weekend were unsuccessful. A spokesman at OSCE headquarters in Vienna declined to comment on Grist. The organization's chairman in office, Finnish Foreign Minister Alexander Stubb, has said the small contingent of OSCE monitors in Tskhinvali had not been in a position to determine how the war started and that it was not his job to make a judgment on the question. But a diplomatic source at the OSCE defended Grist against the charges. "He was a very skilled professional, and there was no reason for him to invent things, but he probably made some people unhappy with finger-pointing," the source said, speaking on condition of anonymity because he was not authorized to comment on the subject. This is not the first time the OSCE has provided the source for reports critical of Georgia's military actions. The German magazine Der Spiegel published articles in late August and again in September saying internal reports by the organization had criticized the Georgian leadership and that NATO officials had intelligence that Georgia had massed 12,000 troops on the border with South Ossetia. Bokeria, the Georgian deputy foreign minister, said the reports in Der Spiegel and The New York Times were wrong. They do "not represent a more balanced view on the situation but rather certain individuals within the OSCE that have leaked information that is inaccurate as stated by the OSCE itself," he said. Tbilisi has also helped muddy the waters about the outbreak of the war. Shortly after Georgian troops entered South Ossetia, officials said the use of force was to "restore constitutional order" in the separatist region. But they later said Russian forces had moved into South Ossetia first, on Aug. 7, and that Georgia had no choice but to send troops to head off an invasion. Paradoxically, these Georgian claims have been bolstered by two reports in state-controlled Russian media. On Aug. 7, state-owned Rossia television showed Sergei Bagapsh, the leader of Abkhazia, the other separatist province within Georgia, speaking at a meeting of the Abkhaz National Security Council. According to the report, which is still on the station's web site, he said: "I have spoken to the president of South Ossetia. It has more or less stabilized now. A battalion from the North Caucasus District has entered the area." In September, a Russian officer who fought in South Ossetia was quoted in an interview as saying his regiment was dispatched from the Russian-Georgian border to Tskhinvali on the evening of Aug. 7 and was fighting Georgian forces the following morning. The interview was published by Krasnaya Zvezda, the Defense Ministry's official newspaper. The paper published another article 10 days later, in which the officer, Captain Denis Sidristy, said the correct date for the advance to Tskhinvali had been Aug. 8.